Kurdish demonstrators gesture during a protest against the curfew in Sur district and security operations, in the southeastern city of Diyarbakir, Turkey (Sertac Kayar/Reuters). Hi folks. It’s been a while. During my hiatus it seems the world has gone mad or madder. I am not exactly sure where to begin. The list of blog topics that I have collected over the last few weeks is long. I am going to pick up where I left off, with Turkey. The Turks are isolated, under pressure, the target of terrorists, on the brink of a wider conflict in Syria, and headlong into a diplomatic crisis with the United States. The Turkish predicament is extraordinarily complex and has much to do with Ankara’s approach to Syrian President Bashar al-Assad, its willful blind eye to extremists fighting the Assad regime, and its foot dragging when the United States asked for access to Turkish bases in 2014 to fight the self-declared Islamic State. I can hear the howling from Ankara already, but Washington has a lot to answer for as well. We’ll never know what might have happened had the United States intervened in the Syrian conflict early on when there was at least a chance of making a difference, but the series of half measures and misbegotten ideas about a negotiated solution to the vortex of violence that has consumed Syrians at an astonishing rate is hard to get my head around. For example, it seemed clear to me—and many others—that Moscow’s primary goal by intervening militarily was to create a situation in which the rest of the world would be forced to choose between Assad and the Islamic State. The Obama administration harbored a different view. American officials believed, rather, that Russian intervention would create an environment where all the relevant players—Assad, Iran, Saudi Arabia, Turkey, Syria’s opposition—would come off of their maximalist positions and negotiate in good faith. This did not even take into account extremists who are fighting in Syria for multiple other reasons only tangentially related to the quality of politics in Assad’s Syria. For the most part, the Obama administration has successfully kept the United States out of Syria, but it has looked weak and feckless in the process. One of the reasons why is American reliance on “the Kurds” to fight the Islamic State in Syria, which has caught American policymakers in the confusing, contradictory, and often surreal world of Kurdish politics and the politics of Kurds in the region. Part of the problem is the way in which Washington thinks about Kurds, who they are, and what they want. In Turkey, there are 14 million Kurds, many of whom are well integrated into the political and economic life of the country, but many others remain alienated. Religious Kurds have been an important and reliable constituency for the ruling Justice and Development Party (AKP). There is also the People’s Democratic Party, or HDP, whose leader Selahattin Demirtas has made a big splash among Western observers for his alleged liberalism. The AKP has sought to portray the HDP and Demirtas as no different from the Kurdistan Workers’ Party (PKK) that has been waging a war on Turkey since the mid-1980s. Suffice it to say that HDP and Demirtas are not as guilty as the AKP suggests, but they are not as pure as their supporters and foreigner admirers believe. The bigger issue is, of course, the PKK. It is a terrorist organization. The Turkish government began a peace process with the group in 2013 that broke down during the summer of 2015 for a variety of reasons having to do with those talks, PKK stupidity, and Turkish politics. 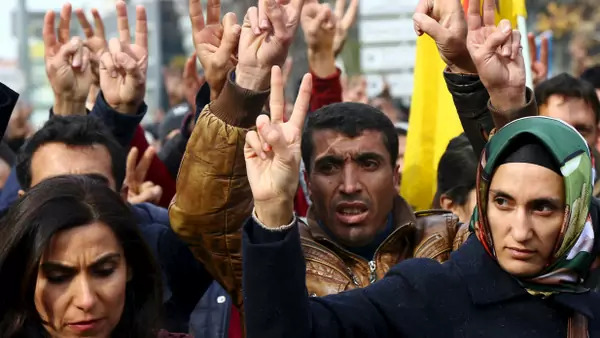 The Turks—along with the Syrian, Iraqi, and Iranian governments—have long suppressed Kurdish nationalism, fearing that it would lead to the fragmentation of Turkey. After the American invasion of Iraq, Turkey was often invoked—okay, I often invoked it—as the most likely neighbor to invade. This was because the PKK ended a five-year unilateral ceasefire in 2004 with American forces occupying the country. This was awkward to say the least, especially since, with their hands full elsewhere, American commanders did not want to fight the PKK on behalf of the Turks. Ankara was also worried that the destabilization of Iraq that ensued would result in the establishment of an independent Kurdish state in northern Iraq. That is likely to happen (perhaps sooner than anyone ever expected), but the Turks are no longer likely to invade, if they ever were. Rather, the AKP has very good relations with the Kurdistan Democratic Party (KDP) under the leadership of Massoud Barzani, the president of the Kurdistan Regional Government (KRG). There is a lot of Turkish investment in the KRG and the Turkish port of Ceyhan will play a major role in Iraqi Kurdistan’s oil exports. Washington likes the KRG and Iraqi Kurds like Washington. Relations between Turkey and the KRG soured after the Turks failed to help when the Islamic State threatened Erbil in August 2014. The KDP controls Erbil and Dohuk provinces, but not the other Kurdish province, Sulaymaniya (often referred to as “Suli” or “Slemani”), which has been a stronghold of the Patriotic Union of Kurdistan (PUK). An offshoot of the PUK, called Gorran, has become a player in Sulaymaniya as well. The PUK is said to be less tribal, more cosmopolitan, and more willing to deal with Baghdad than the KDP. The Talabani family is the major player in the PUK. The security forces of the two parties fought a brief civil war in the mid-1990s during which thousands were killed. Even though the two sides have apparently let bygones be bygones, the wounds have not entirely healed. Much of this has to do with the fact that the PUK (and Gorran) do not want to allow the KDP to dominate Iraqi Kurdistan and other parts of the Kurdish world, which is where things get interesting. The KDP’s Barzani has colluded with Turkey against the PKK and was noticeably slow to send assistance to Syria’s Kurds during the Islamic State’s siege of Kobani. This is because Barzani wants to be the king of the Kurds and does not want to upset Ankara, which is important to Kurdish independence in northern Iraq. The PUK, wary of the Turks and Barzani’s dominance, has coordinated with the PKK to balance both Ankara and Erbil. In Syria this meant that the PKK helped the Syrian Kurdish Democratic Union Party (PYD)—allied with the PUK—and set up the People’s Protection Units, or YPG, after the Syrian uprising began. The YPG has been in the news a lot lately because its fighters—men and women as the press likes to point out—have been effective against the Islamic State and have become an ally of the United States. Here is where it gets even more interesting. As I implied just above, the ties between the YPG and the PKK are closer than the commonly used term “affiliated” would suggest. This has made life difficult for the American policymakers who correctly insist that Turkey has a right to defend itself against the PKK, while at the same time insisting on coordinating with the YPG against the Islamic State. This is an affront to the Turks who fear that the PYD, the YPG, and the PKK will carve out an independent entity in northern Syria, leaving what amounts to a terrorist state on its southern border with its eyes on southeastern Turkey. The Obama administration has tried hard to maintain the fiction that the YPG and PKK are distinct entities, but this has convinced absolutely no one. Even as American diplomats were claiming last summer that they were making progress bringing the Turks around to the way the United States viewed the YPG, Turkish President Recep Tayyip Erdogan was declaring that Ankara would never accept what the Kurds call Rojava, meaning Western Kurdistan, which covers northern Syria. So now the Turks are shelling YPG positions in Syria while the YPG continues to coordinate with the United States as well as Russia, leading Turkish officials to conclude that both Washington and Moscow are colluding against Turkey. The Turks want the United States to choose between them or the YPG (and by extension the PKK). It is a bind for American officials. They can either sign up with the Turks, thereby undermining what they have going with the YPG against the Islamic State, or ditch Turkey altogether. Neither serves U.S. interests so the administration has split the difference. Presidents Barack Obama and Erdogan had a long call the other day. The readouts of the call that the two governments provided indicate differences between Washington and Ankara. For a long time Turks have suspected—erroneously—that the United States supports the PKK. It did not, but the emergency that the Islamic State represents has done funny things to American foreign policy. In Washington, it is time for a discussion of whether the PKK and YPG are terrorist groups or not. If they are not, policymakers should brace for a change in bilateral relations with Turkey. The Turks are not quite as indispensable an ally that they have been made out to be for a long time so perhaps it is worth taking the hit. In the meantime, when Washington tells Turks that its stands with them, they have every right to be incredulous.